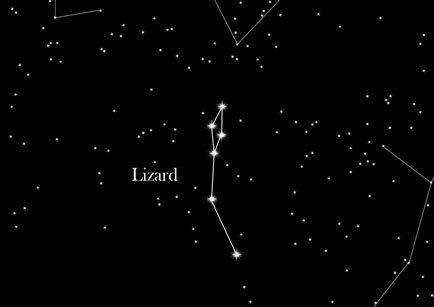 The Lizard is a nondescript and small constellation. It contains only a single star, no brighter than magnitude 4. The Lizard does not belong to the classical constellations of antiquity, as it was not discovered until much later. The Lizard is pretty unimpressive in the sky and bordered to the north Cepheus, Swan on its left, and in the south is the constellation Pegasus. In East are Andromeda and Cassiopeia. The constellation Lizard does not belong to the classical constellations of the ancient world. Nevertheless, there are some equally interesting stories about the Lizard, as in the classical zodiac in the form myths. This constellation was introduced in 1687 by Johannes Hevelius, a Danzig Astronomers. Its name was originally different, but it was not politically accepted at the time, and so, it was renamed to the „Lizard“.